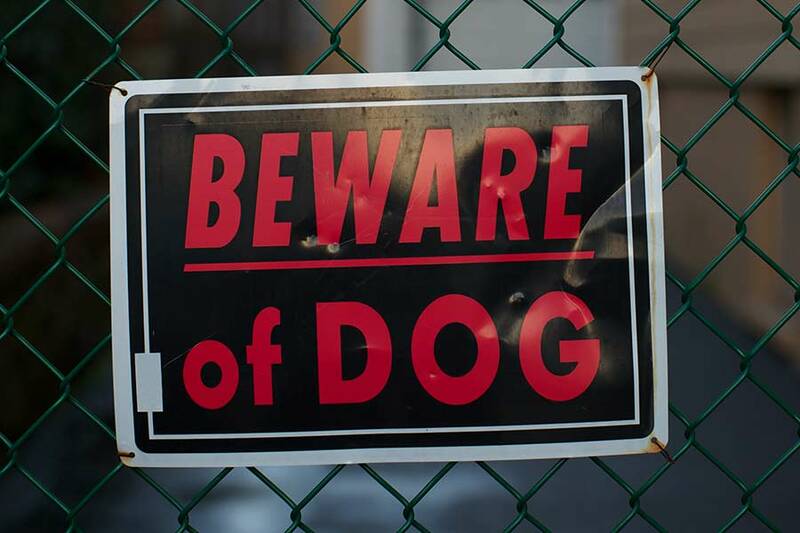 More than five million people are injured by dog bites and animal attacks every year in the United States. And according to one of the nation’s largest insurance companies, State Farm, there were more dog bite claims in California than in any other state. In 2010, the company paid out more than 11 million dollars in claims to individuals injured by dog bites in California alone. Depictions of dog attacks are sometimes comical, such as in cartoons where the family dog chases after a postal worker. But the reality is dog attacks are serious, and potentially even deadly. More than 5,000 postal workers are attacked by dogs each year. Worse yet, the largest group of animal attack victims are actually children—more than 60% of dog bite victims are less than 12 years old. It’s important that all children and adults learn how to be safe around dogs and other animals. However, in the state of California, animal owners are ultimately responsible for the actions of their pets, even on their own property. You do not surrender your right to safety when you knock on a neighbor’s door or you pass their house on the sidewalk. Under California dog bite laws, owners are “strictly liable” for any and all injuries caused by their dogs and other animals that they own, no matter the previous history or temperament of the dog. There is no “one free bite” in California. Even the best-behaved dogs can attack unexpectedly, and their owners— and potentially other parties such as dog walkers, kennels, and landlords—are responsible for their pet’s actions. Dog and animal owners in California are strictly liable for any injury caused by their dogs and other domestic animals. Victims of dog bites and animal attack are eligible to recover financial damages, even if the animal in question had never previously attacked someone. There are very few exceptions to California’s dog bite laws. At Ashton & Price, we have a deep and up-to-date understanding of California’s animal attack statutes, and we have helped many in Sacramento and throughout California recover millions of dollars in compensation. With more than 40 years of combined experience in personal injury litigation, our attorneys have helped our clients recover more than $200 million in personal injury settlements and jury awards since 1996. We will fight for you and your rights, and help you receive the money you need to recover your life and your health. Receiving immediate medical care is of paramount importance when you have been bit by an animal. Sacramento is home to some of the best health care providers in the country, and we’ll work to make sure that you benefit from that care, even if you lack adequate health insurance, and cannot afford to pay out-of-pocket medical expenses. It’s important to us that you heal and recover from your injuries. Necessary care may include emergency care and plastic surgery. The cost of these interventions makes it even more important for you to secure appropriate legal representation. Obtaining professional legal help is especially important when children are the victims of attacks. Small children are especially vulnerable to injuries that can require months or years of expensive hospitalization, and result in a permanent and serious loss in quality-of-life. Special legal rules apply to children who are age 5 or younger at the time of their attack, which is why it’s critical for you to consult with Ashton & Price if your child has been injured in an animal attack. We will help you or your loved ones received the medical care that you need and deserve. Once you have sufficiently recovered from your injuries, we will negotiate with the responsible parties and their insurance providers so that the cost of your medical care will be covered, and that you’ll be suitably compensated for injuries and damages. As is often the case after car accidents, very few people know what to do immediately following an animal attack in order to protect their legal rights and wellbeing. If you or a family member has been injured in an animal attack, it’s important to immediately contact a lawyer at Ashton & Price who is well-experienced in the field of California dog bite and animal attack law. After you’ve been attacked by an animal, the first and foremost priority is to get to the hospital. Everything else comes second. Not only will immediate medical care give you the best potential recovery from your injuries, it will also provide documentation that may prove to protect you in a legal sense. Take a picture of the dog or other animal that attacked you. Obtain the name and contact information of the animal’s owner, and/or the person(s) responsible for the animal at the time of the attack. Obtain the names and contact information of any potential witnesses who were present at the scene, or who saw or heard any element of the attack. Take pictures of your injuries before, during, and after treatment. It may make it easier to remember the above steps if you keep in mind that they’re quite similar to what you do after a car accident: obtain contact info, document as much of the scene as possible, and document your injuries. Can someone other than an animal’s owner be legally responsible for the animal, and liable for damages? In some situations, it’s important to look beyond just the person or persons who own a dog or other animal that has caused injury. Sometimes animals are solely under the control and care of someone who isn’t the owner. Other times, a person may be essentially “judgment proof,” in the sense that they have no insurance or assets of any financial value. These situations can be very complicated and delicate. If this is the case in your injury, it’s especially important that you consult with legal representation experienced in such complex situations, such as an attorney at Ashton & Price. Animal caretakers: Anyone who takes physical control of an animal on the behalf of the owner can be held financially responsible for the animal’s actions. Dog walkers, kennels, and other individuals who have custody of or assume control of a dog or other animal at the time of an attack can be held legally liable. Property landlords: In some cases, landlords can be held responsible for animal attacks that occurred on their property, even if they don’t own the animal in question. Banks and other lenders that lease property: After the housing market crash and the foreclosures that followed, many banks and lenders assumed control of homes and other property in California. Many such businesses tried to minimize their losses by renting these properties out to other parties, rather than letting them sit empty. In these cases, the controlling bank or lender becomes a landlord, and as such, assumes a duty of reasonable care, making them financially responsible for animal attacks that occur on the property. Getting to the bottom of what happened in dog bite and animal attack cases is of critical importance, and requires skilled and experienced investigation. Quite often, owners will attempt to confuse the situation and muddy the waters by weaving a complicated story of he-said-she-said. Due to our experience in such matters, Ashton & Price will conduct an aggressive inquiry into what happened, gathering witness statements, researching and gathering records, and determining an animal’s (and their owner’s) history. We will use all of this information to determine the best approach your case. Part of what makes investigating dog attacks difficult is that often, the owner and the victim know one another. We know that many people are hesitant to obtain legal representation or file a lawsuit, because the dog owner is a friend, neighbor, or even a family member. You likely don’t want to cause them any financial hardship, and the fear of creating lasting “bad blood” is completely understandable. While we are aggressive in protecting our clients and securing the best possible outcome for them, we are compassionate and understanding when negotiating with the responsible owner and their insurance company. We know that in many cases, you will know and associate with the other party long after your case is settled, and we want to not only preserve your well-being, but your relationship with the other party. The prospect of bringing a lawyer into the picture can be scary, but being injured by a dog or other animal can be financially ruinous to you and your family, and not immediately securing legal representation can seriously impact your ability to ultimately receive financial relief. It’s important to remember that in most cases, the animal owner is not paying for your settlement out of their own pocket, but instead have insurance coverage that will cover your damages. At one time, California was similar to many other states, in that persons attacked by dogs and other animals could only recover damages if the animal’s owner had previously known that the animal was potentially dangerous. The consequence of this was that thousands of people found themselves completely financially responsible for expensive medical care necessitated by being attacked by another person’s dog or other animal. This lax approach to pet owner responsibility led many to dub such liability situations as “first bite free” or “one bite laws.” Until an animal had attacked somebody, an owner had no civil liability for their animal’s behavior. Due to the obvious problem this presented, many Californians pressed for reform. As a result, Civil Code section 3342 was passed, which assigns dog owners with strict liability for their dog’s actions in any situation where a person is attacked while on public property, or legally on private property. This code generally applies to attacks involving all domesticated animals—such as cats, horses, and exotic animals—as long as the attacked person did not cause the attack by provoking the animal, or through negligence.